Paying tribute to Brazil's black women and presenting the first transgender samba school muse on the Sambódromo, Salgueiro promises to thrill the audience on Monday, February 12th. RIO DE JANEIRO, BRAZIL – On Monday, February 12th, Salgueiro samba school will enter the Sambódromo to participate in the 2018 Grupo Especial championship. Originally from Andaraí, in Rio’s Zona Norte, Salgueiro is expected to shine at Sapucaí with a strong samba enredo on the power of Brazilian black women. This year, Salgueiro will enter the Sambódromo honoring the bravery of Brazil’s black women, photo by Raphael David/Riotur. One of the most popular samba schools in Rio, Salgueiro used to be part of the “Big Four” – the best samba schools from Grupo Especial, along with Mangueira, Império Serrano and Portela. Because of the school’s excellence and high-standard performances, Salgueiro is one of the few schools that has never been lowered to the Second League. Its most recent title (out of seven) was conquered in Carnival 2009, with a samba enredo dedicated to the drums. Salgueiro was founded in 1953, and is highly renowned for its tradition. The school was born in Morro do Salgueiro, in Andaraí (Tijuca’s region, in Zona Norte), from the fusion of two local Carnival blocos. After its debut on the Avenida, in 1954, Salgueiro has many times payed homage to the heroes of Brazil’s black history, like Zumbi dos Palmares. 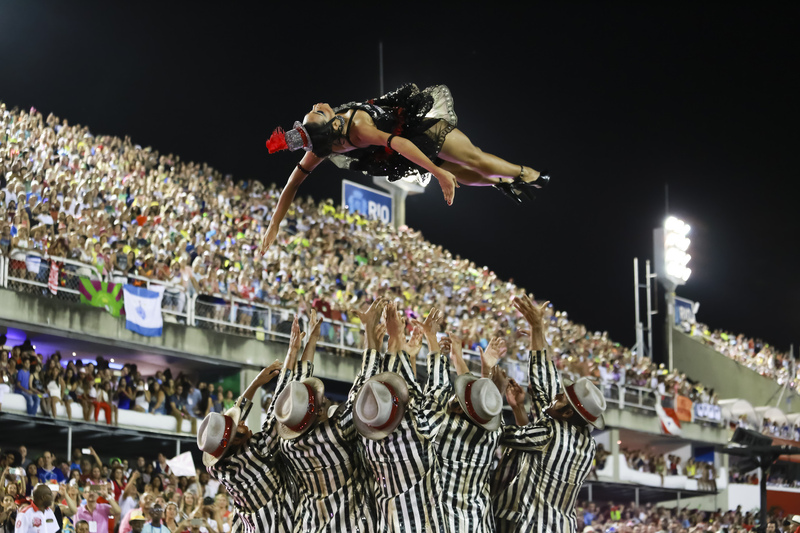 Apart from the talent of its dancers and the wisdom of its “velha guarda” (the samba schools’ old folks), Salgueiro is especially respected for its bateria (the drums), known as “Furiosa” (Furious). Predominantly influenced by the “Alujá”, sacred rhythm of Xango, orisha (god) from the Candomble religion, the Furiosa was awarded seven times as the best samba school bateria by Jornal O Globo’s “Estandarte de Ouro”. In 2004, Salgueiro’s velha guarda was nominated for the Latin Grammy, the most important music award in Latin America, in the category “Best Samba/Pagode Album”. Known for its high-standard performances, Salgueiro was seven times first placed in the Grupo Especial championship, photo by Tata Barreto/Riotur. This year, Salgueiro will be starring at the Sambódromo with the samba enredo “Senhoras do Ventre do Mundo” (The World Womb Ladies), a homage to the bravery of black women from Brazil. Written by Xande de Pilares, Demá Chagas, Dudu Botelho, Renato Galante, Jassa, Leonardo Galo, Betinho de Pilares, Vanderley Sena, Ralfe Ribeiro and W. Corrêa, the samba lyrics highlight the role of the African female ancestors in the foundation of Brazil’s culture. “The black woman is the regent, the soldier; she is mother, lover, partner, teacher, poet. She is the one by the side of the child, the one who introduces words in our vocabulary, who makes our food more delicious, who educates. She is, thus, the multiple women throughout Brazil’s history,” defines Alex de Souza, Salgueiro’s carnavalesco, to media outlet Jornal do Brasil. Besides honoring both historic and contemporary black female personalities, Salgueiro will stand out, above all, for being the first samba school to bring to its parade a transgender woman, Kamilla Carvalho. “The samba portrays fierce black women. And it talks about women who inspired and empowered other women. I believe this theme represents me,” says Carvalho, who will play a queen in Salgueiro’s parade. Those interested in participating in Carnival 2018 still have the opportunity to walk on the Sambódromo with Salgueiro samba school. In order to purchase a costume, click here to access Salgueiro’s official website.